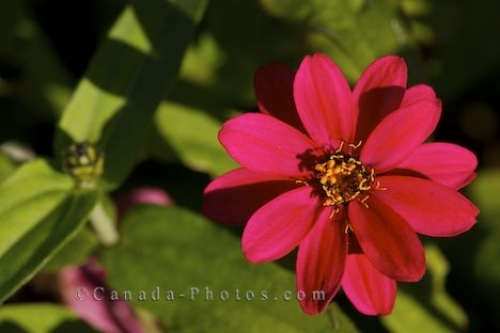 The vibrant red coloring of this Zinnia flower in the Garden of Innovations at the Montreal Botanical Garden in Montreal, Quebec stands out amongst the others. The Zinnia is a common plant which many people decorate their gardens with, starting to grow from a seed and one which will reseed itself every year. A type of flower which blooms in a variety of colors with each species of Zinnia altering its appearance in the layout of their petals. This flower in full blossom at the Montreal Botanical Garden shows off its beauty with a single red flower and each petal beautifully shaped. Tended to by some of the best gardeners at the Garden of Innovations, these Zinnias are a prime example of the perfect flower. Zinnia, Profusion, in the Garden of Innovations at the Montreal Botanical Garden, Jardin Botanique de Montreal, Hochelaga-Maisonneuve, Montreal, Quebec, Canada. Picture of a blossoming Zinnia flower in the Garden of Innovations at the Montreal Botanical Garden in Quebec, Canada.